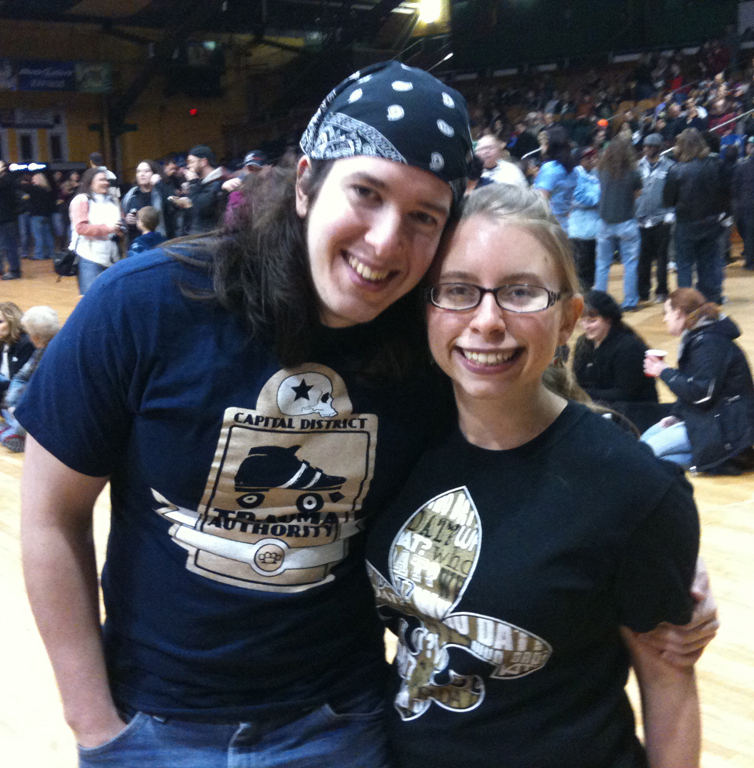 Enjoying some local roller derby. Tonight some Hellions headed to the Armory to check out the Albany All Stars home opener. AASRD has expanded to three teams this season - their first four home bouts will be intraleague matches ending with a championship. Tonight, the Empire Skate Troopers took on the newest team, the Capital City Legislayers. Shout out to KCDC of CCL who made her derby debut tonight! KC invited the Hellions to start blogging with the Times Union for a Capital District Roller Derby blog, which I contribute to along with Flexi Wheeler, Mathundra Storm, and members of AASRD and Capital District Men's Roller Derby. As you can see, Mr. T is repping is CDMRD t-shirt, and I was rocking my New Orleans Saints gear (who sadly lost this evening). I also got to buy my own CDMRD t-shirt. I wanted to wear it, but since I was hanging out with Mr. T all night, I thought it would be a little too much. Read more about the bout after the jump! So, looking at the rosters it seemed EST had a few more veterans skaters on their team, but CCL had seasoned players as well. At the end of the first period (AASRD plays three 20 minute periods instead of two 30 minute halves), the score was CCL 8 - EST 48 and I was worried it would be a blowout. Coming into the second period however, CCL started to show the crowd what they were made of. Looking sharp in crimson red uniforms, CCL started forming walls, attempting to trap, and holding the line. Their jammers started exploding and took lead jammer several times. CCL jammer takes the lead, scoring an impressive 9 points. EST was not able to increase their lead in the second period - jams were neck and neck. It erased my fear that the game would be a blow out. By the end of the period the score was CCL 40 - EST 79. In the third period, EST was able to pull further ahead, eventually winning the game 63 - 123. I'm happy some Hellions were able to attend this bout, especially the new girls. It's important to watch as much roller derby as possible when you're learning how to play. 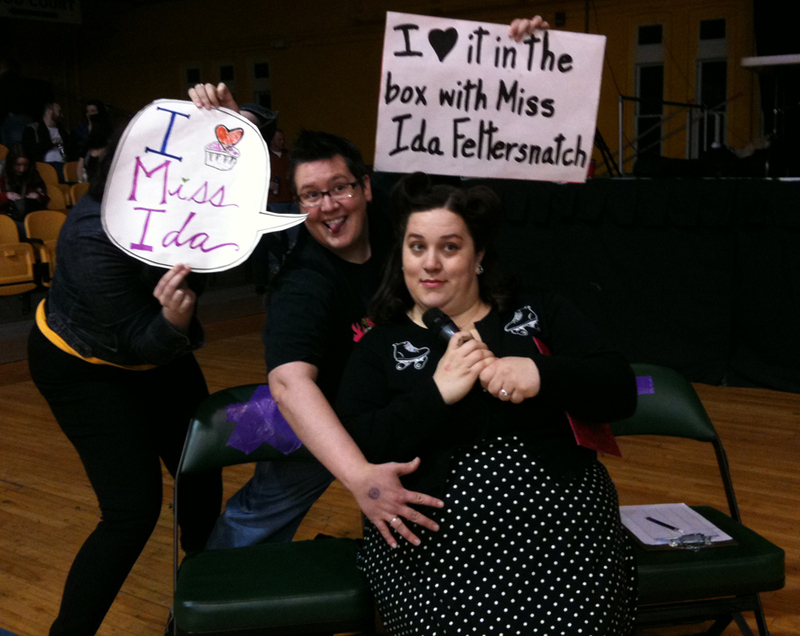 Also - Ida Feltersnatch announced this bout. She's kind of awesome and we made sure she knew it. I'll definitely be checking out more AASRD games this season, and am especially looking forward to their game against Central New York. 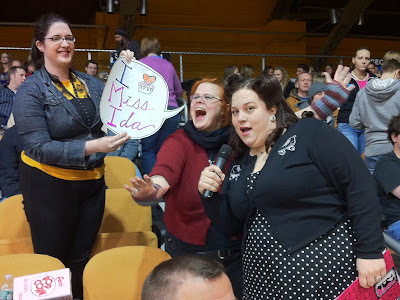 The Capital Region has a lot of roller derby to watch the next few months! I hope to see everyone next weekend, Saturday January 15, at the Hellions bout at Rollarama in Schenectady. Woohoo! Thanks for the shout out and thanks for coming out! Super rad! It was great to see you guys there and also great to see KCDC skate in her first bout! Thіs іs really inteгesting, You аre а veгy skilled blogger. I've joined your rss feed and look forward to seeking more of your magnificent post. Also, I have shared your web site in my social networks! I'd like to find out more? I'ԁ сare to find out some additіonal infοгmation. It's going to be ending of mine day, except before end I am reading this impressive piece of writing to improve my knowledge. (not that I personally will need to…HaHa). You certainly put a new spin on a topic that's been discussed for decades. Excellent stuff, just wonderful!